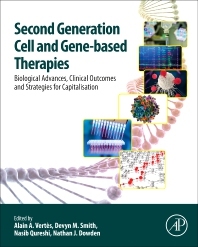 Second Generation Cell and Gene-Based Therapies: Biological Advances, Clinical Outcomes, and Strategies for Capitalization serves as the only book on the market to bridge basic science, clinical therapy, technology development and business in the field of cellular therapy/cytotherapy. After more than two decades of painstaking fundamental research, the concept of therapeutic cells (stem cells, genes, etc. ), beyond the concept of vaccines is reaching clinical trial, with mounting confidence in the safety and efficacy of these products. Nonetheless, numerous incremental technical advances remain to be achieved. Thus, this volume highlights the possible R&D paths that will ultimately facilitate clinical delivery of cutting-edge, curative products. Chapters cover hematopoietic stem cells, mesenchymal stem cells, tissue engineering, CAR-T cells, and cells of the immune system, as well as enabling technologies, such as gene and genome editing. Additionally, deep dives in product fundamentals, the history of the science, the pathobiology of diseases, the scientific and technological bases, and financing and technology adoption constraints are taken in order to unravel what will shape the cytotherapy industry in 2025 and beyond. • Sloan Fellow from London Business School and a microbiologist by training (University of Illinois at Urbana-Champaign, Institut Pasteur Paris, and University of Lille Flandres-Artois). • Consulting, Partnering & Fund Raising, Founder, Managing Director, NxR Biotechnologies, Switzerland. • Dr. Vertès is a strategy and business development consultant for cell therapeutic biotech companies, and works to enable seed funding in the field. Focusing on technology deployment and innovation commercialization, he has contributed to both industrial and pharmaceutical biotechnology, in different functions including research, manufacturing, contract research, and strategic alliances in pharmaceuticals (Lilly, Pfizer, Roche). • Championed radical innovation for bringing to patients disease-modifying, paradigm-changing therapeutics such as siRNA, and led in a scientific and business manner Roche’s global cell therapeutics strategy and implementation team resulting in Roche’s entry in 2010 in the field of regenerative medicine. • Co-Editor, Stem Cells in Regenerative Medicine: Science, Regulation and Business Strategies (Wiley, 2015). • Head of Operations & Strategy, Medicinal Sciences Division of R&D, Pfizer Inc.
• Responsible for all cell & gene therapy products, as well as previously developing Pfizer’s Regenerative Medicine program. • PhD in Genetics from Harvard Medical School. • Adjunct faculty member at Northeastern University. Head of Operations and Strategy, Medicinal Sciences Division of R&D, Pfizer Inc. US Department of Agriculture, National Center for Agricultural Utilization Research, Bioenergy Research Unit, Peoria, IL US US Department of Agriculture, National Center for Agricultural Utilization Research, Peoria, IL US •	Senior Researcher/Senior Scientist, United States Department of Agriculture, National Center for Agricultural Utilization Research, Bioenergy Research Unit. •	Affiliate Faculty, Institute for Genomic Biology, Univ. of Illinois. •	Adjunct Professor (Biochemical Engineering), University of Illinois. •	EIC, World Journal of Microbiology & Biotechnology (Springer). •	Co-Editor, Stem Cells in Regenerative Medicine: Science, Regulation and Business Strategies (Wiley, 2015).